Estuary evolution is investigated using the hydrodynamic and sediment transport model, Delft3D, to study the response of a dammed tidal basin to restored tidal processes. The development of decadal (10-year) morphological simulations of the restored estuary required simplifying several data inputs and implementing a time-scale acceleration technique. An innovative river sediment discharge schematization was developed that connected sediment discharge to morphological change in the estuary. Mud erodibility parameters were determined from laboratory analysis of sediment cores from the modern lakebed and statistical refinement with a Bayes network of the probability of occurrence. The changing estuary morphology appears to have a dominant impact on the physical habitat (substrate, inundation frequency, mean salinity, and salinity range). The numerical model provides a tool to compare the functions of the historical estuary and possible future alternatives for a restored estuary. Sensitivity of the morphological model to sediment types and erodibility parameters was also examined. 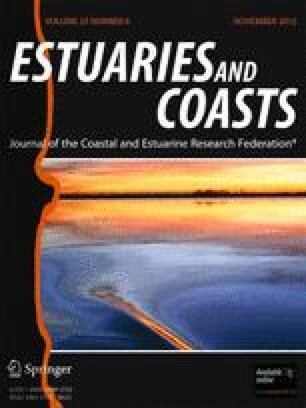 A conceptual model covering morphology and indicators of physical habitat for three phases of estuary evolution during restoration is presented that could be applied to estuarine systems that are severely out of equilibrium. This work was part of a large collaborative process, and we would like to acknowledge the contributions of the Deschutes Estuary Feasibility Study Technical Committee, including Curtis Tanner, Steven Morrison, and Nathaniel Jones. Giles Lesser was instrumental in developing the morphological modeling techniques. We thank Edwin Elias, Jodi Eshleman, and Bert Jagers for their assistance in executing the project. We thank George Tate and Craig Jones for help collecting cores and performing SedFlume analysis. Nathaniel Plant provided guidance in applying the Bayesian model to the erodibility data. The manuscript was greatly improved by input from Jessica Lacy, Greg Hood, Neil Ganju, and an anonymous reviewer. This project was funded by the Salmon Recovery Funding Board (SRFB), the Washington Department of General Administration, the Puget Sound Action Team, the Port of Olympia, and the US Geological Survey Coastal and Marine Geology Program. We thank our friends and colleagues for their support during this multiyear effort.